If great powers tried to break your country up, I wonder how much of a "nationalist" you yourself would be. Or would you just sit there avoiding the issue in order to avoid taking up what your great power opponents would vilify as a "nationalist" position? One other thing: you seem to know where Mladic is. Why don't you (or those who've spun you the story so well as to convince you) simply give the Serbian authorities (or Dutch intelligence, or the ICTFY or the media) Mladic's address in Belgrade so he can be detained / exposed / kidnapped or filmed or whatever at his house or at one of these meetings you claim he keeps having? In other words, don't be gullible fodder for New World Order or old Balkan anti-Serbist prpagandists. And may you never be put in the situation in which the Serbians have been in for decades: forced to fight for their country or be illegally divided into the newly-created concoctions of the real nationalist extremists. Of the Balkans, local extremists like Tudjman and Ceku and yes, the late Izetbegovic, supported by US (and German) nationalist extremists operating out of area. Only if you found yourself in such a situation would you realise how wrong your inner labels and categories for viewing this conflict actually are. Dear Marko, I am myself against breaking up Serbia, so we are both on the same side. My post is a denunciation of the US/big powers' policy, of whose hypocrisy the Dutch have been a victim, too. It is my opinion, that the Serb government has proposed sufficient guarantees for Kosovar cultural autonomy and against eventual ethnic or religious discrimination of Albanians within an unified Serbia, for the EU to accept and to maintain the territorial integrity of Serbia. 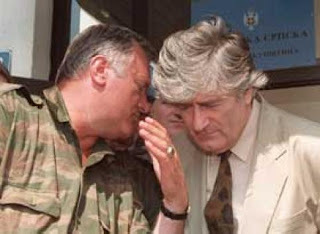 Breaking up Serbia and create a Maffia State in Kosovo, is a bad policy. For the whole world! And looking back, if the world had effectively opposed on principle the unilateral NWO 1999 attack on the then FR Yugoslavia, an attack violating all relevant international law, made in the name of alleged western 'humanitarianism', would the “New World Orderer” have been so able to move on to unilaterally attack Iraq? Which is another reason I believe it important to support Serbia against the new US plan: to unilaterally dismember other sovereign states' territorial integrity by imperialist decree. “Satanised” Serbia is an easy target by which the NWO seeks to establish a fresh, "satanic" principle. Which it will then presume to implement elsewhere.